Sam Wilson was born on September 13, 1766 in Menotomy. His parents were Edward and Lucy Wilson and they had thirteen children. Menotomy is now called Arlington, Massachusetts. Wilson only lived in Arlington for 14 years before his family moved to New Hampshire. His nickname Uncle Sam would not come until much later in his life when he lived in Troy, New York. But, Arlington would never forget the legend’s humble roots. Travel brochures still boast his name. But, why? The town of Arlington has a pretty rich history – one that began before the United States were united. Arlington was called Menotomy and was just a part of Cambridge. It was purchased by Squaw Sachem around 1638 for $10 and the promise of a new coat every winter. In 1637, Captain George Cooke visited and discovered that it would be a great site for a mill, and so the development began. The “Committee of Safety” was meeting on the night of April 18, 1775 in one of the taverns that had been built (on what is now 333 Mass. Ave.), when the British rode by on their way to Lexington and Concord. They night before the war began. By some accounts they rode by on what is now, Massachusetts Avenue (or at least really close by). On that same night, Paul Revere rode by Sam Wilson’s house. Some accounts say that Sam went out that night with drums to awake the neighbors. By 1780, the Wilsons left Menotomy and moved to another farm in New Hampshire. Sam would never come back to Arlington, but now, more than 200 years later, a statue boasting his name still stands near the center of town. What did Sam do to gain a statue and worldwide recognition? Well, in reality, not much. In 1789, Sam and his brother decided to get off the farm and walk to Troy, New York for better work opportunities. They started in the brickmaking industry and then, eventually, switched to meat packing. He was hired by Mr. Elbert Anderson to pack meat for the Army and wrote “U.S.” on the packing barrels. The Irish fellow said that the packages belonged to Mr. Anderson and Uncle Sam. This joke spread throughout the meatpackers and the soldiers he was feeding. And, well, as we know now, it became more than just a little joke among troops. Uncle Sam created his own meat packing business after the war. He was married, he had 4 kids (two of which died in childbirth), he died in 1854 and is now buried at Oakwood Cemetery in Troy. But, that is far from the end of his story. During WWI, he became most well know when he appeared on the cover for the July 6, 1916 issue of Leslie’s Weekly and was then also used as a recruiting poster during WWII. According to the Library of Congress, over 4 million copies of the famous Uncle Sam poster were printed just between 1917-1918. Fast forward a little farther into the future back in Arlington. Actually fast forward to one of the lease patriotic times in American history. Support for the Vietnam War was scarce in the 1960s as patriotism was not always seen as the positive it once was. But, it seems at lease some Arlington residents searched for some hope through the man that was born in their town years before. And that was that. The Bill was passed. 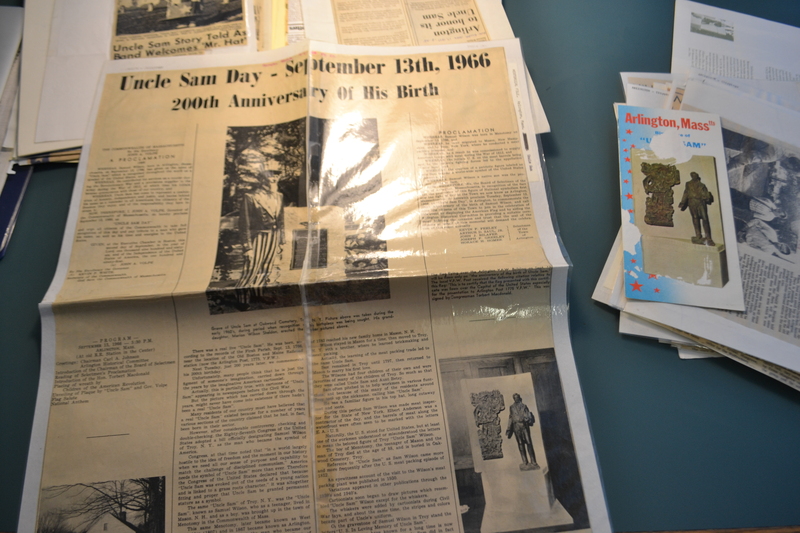 In the 60s, there was an Uncle Sam exhibit at the New York World’s Fair. 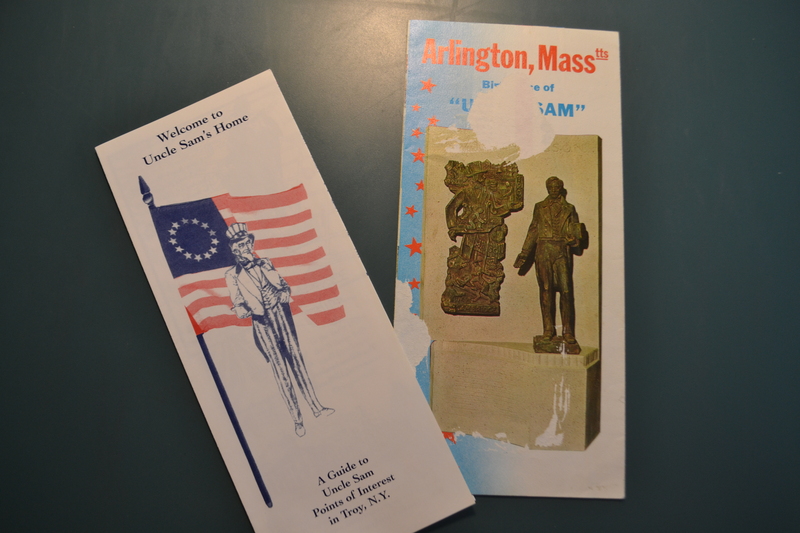 Uncle Sam medals were sold on Patriot’s Day in Arlington in 1970. 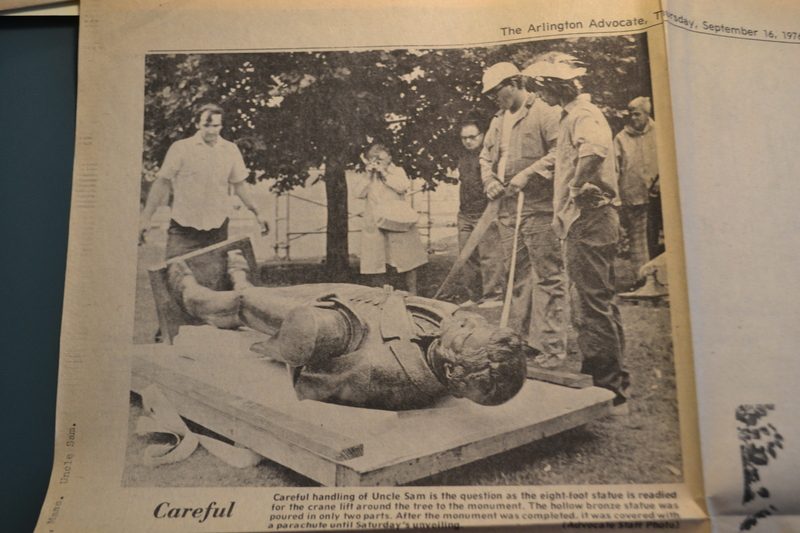 In 1972, the week of September 10 was declared Uncle Sam week in Arlington and funds were donated to erect a statue in his honor. The statue was unveiled September 11, 1976 near the same road, Mass. Ave. that Paul Revere rode is famous ride. Do a Google image search for Uncle Sam. See that though the iconic image of him pointing, staring and luring men and women to volunteer to join the U.S. Army for WWI shows up, plenty of appropriated images, using Uncle Sam to show the negative side to America show up as well. Uncle Sam has continued to change through the times and people turn him into what they want, positively and negatively. It is almost a right of passage for cartoonists to draw their own version of him. No matter how many times he is portrayed or drawn or used to make a statement, Arlington will forever be the birthplace of Uncle Sam. Thanks to the Robbins Library in Arlington, Mass. 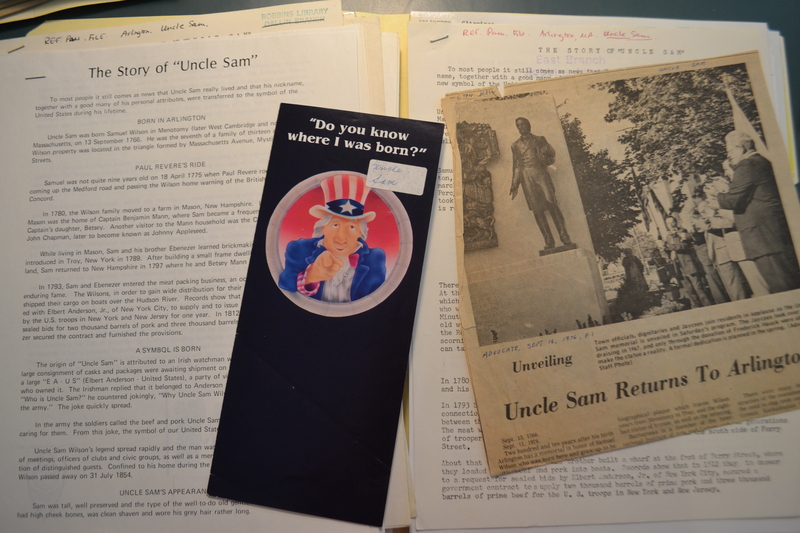 for allowing me to look through the archives to find the history of Uncle Sam.